Rollerbladers have spent countless hours listening to podcasts, reading articles, and debating on forums about how to save rollerblading, whether or not it needs saving in the first place, or any number of variations on the subject. It’s a complex issue with many factors at play but we all seem to agree that we need to get more kids interested in rollerblading. There are plenty of ways to go about this. Whether it be Kaltik’s Jr. K skate which aims to give kids the proper equipment to participate, Jon Ortiz and Ray Mendez ‘s company Go Sports USA which puts thousands of kids on inline skates every week throughout public schools in NYC, or the average blader letting a curious kid try on their skates at a skatepark. With an intimidating trick vocabulary and an infectious positive outlook Matt is an ideal candidate to represent the “aggressive” side of rollerblading. So when he launched a GoFundMe last December hoping to crowdsource enough money to pay for inline instructor certification through a SkateIA clinic taking place in Atlanta, Georgia Blader Union jumped at the chance to help out by covering the cost of the course. With the additional support of the blading community the expenses for his trip were paid for in a matter of days. Matt’s goal is to not only inspire the next generation of shredders with his skating but to help them take those first steps into the sport by teaching the fundamental skills necessary for that passion to take root and flourish. It’s been a few months since he successfully completed his course and we thought it would be a good time to catch up with Matt to see what he took away from SkateIA and how he plans to put his new instructor certification to work in 2019. What made you decide to pursue your inline skate instructor certification? In the last half of 2018 I was in deep thought about what my next goals are for 2019. I had just moved back to Columbus, Ohio mid year from Charlotte, North Carolina where I accomplished my goal of making my first full length aggressive skate video "SCRUB$" with the idea of making it more enjoyable for viewers who don't skate. With 2019 creeping up and the negative state that skating just came through I still had hope for it so I made it a goal to skate more for others than myself so I reached out to a local buddy of mine, John Hoch, who organizes some community based rollerblading events in Ohio and expressed to him my need to help skating. He then told me about some free skate clinics going through March to May that he was doing alone. Immediately, I'm in. However, I have no teaching history so I contacted Long Tonthat at Oak City Inline Skate Shop in December 2018 to discuss what I wanted to do and the vision I seen. He told me about skate IA and my first reaction was "what? I've done this my whole life what else could I learn?" He said that I do have skill in the sport but [asked] can I really teach someone from ground up? Long said to me "if you really mean what you just told me and are serious.. go get SkateIA certified it will open the doors you want to go through." I trust Long so I said ok lets do it. Needless to say none of it was planned but when I made that conscious design to make a difference the doors started opening already. When you mistake a SkateIA banner for bamboo. Hoodpanda problems. Can you give us a general overview of what the level 1 inline certification covers? So in the program you learn to successfully teach someone who just put on a pair of blades with basic skills like the V walk to basic stride, heel and toe stop, parallel turns, skating backwards and pivots. While at the same time learning to manage a safe and effective class but it's very useful for one on one lessons as well. They also teach you how to market yourself as an instructor which was very useful. The course took place over one weekend in Atlanta, what did your schedule entail? Day one, meet and get a class room style overview of what Skate IA is about and what's to come in the weekend. Day two was about twice as long as day one, 9 hours to be exact, but you finally get on your skates for hands on learning of the skills you'll be teaching. Along with role playing as teacher and student to feel out how it can be. Day three is just as long as day two! But you practice what you've learned and read about it a bit more, ask questions then they do a written test and teaching/demonstration test to make sure you retained everything well and give good constructive criticism. The examiners were very good at making the whole weekend fun and enjoyable. Of course in-between I went to get clips or aggressive skate as much as possible. How many participants where there for your session? A lot of us came up at a time where lessons weren't something we had access to. We learned the basics through trial and error and once we got into the aggressive side of the sport that self-taught approach was engrained. Just rewind the latest VG over and over or watch someone at the park and imitate what you saw until you could do it yourself. Obviously that's not the easiest or safest way to learn how to skate. So has completing this course given you a better understanding of your own skating and how you'd explain the fundamental skills we take for granted to a novice? Can you give us any examples? Absolutely! I had no idea how many other rollerblading cultures were out there and it seemed that aggressive was the only one hurting. I guess it was my aggressive blading background had made me very close minded to the idea of that for awhile. So first thing I had to do was let go of everything I thought a knew and take in what I need to know.. They make you take the course with a brake on your skate (first time for me lol) because one of the biggest reasons people give up is because they don't know how to stop and that leads to a fall that novices are not ready for. So we have to start with getting people comfortable on these foot loving wheel boots with proper form and information so that they don't take that "quit fall." I mean, it makes sense no one wants to get hurt but even in life the same fundamental rule applies, it's not if your going to fall it's when you're going to fall, but you need to know how to get back up and keep rolling towards that love and free spirited release that blading can give back to you. With that being said my outlook on rollerblading as a whole changed. I've been trying big wheels now and I love them because I have no pressure, just wander when I'm on them and those same elements can be used in a creative way at a skatepark or street spot. 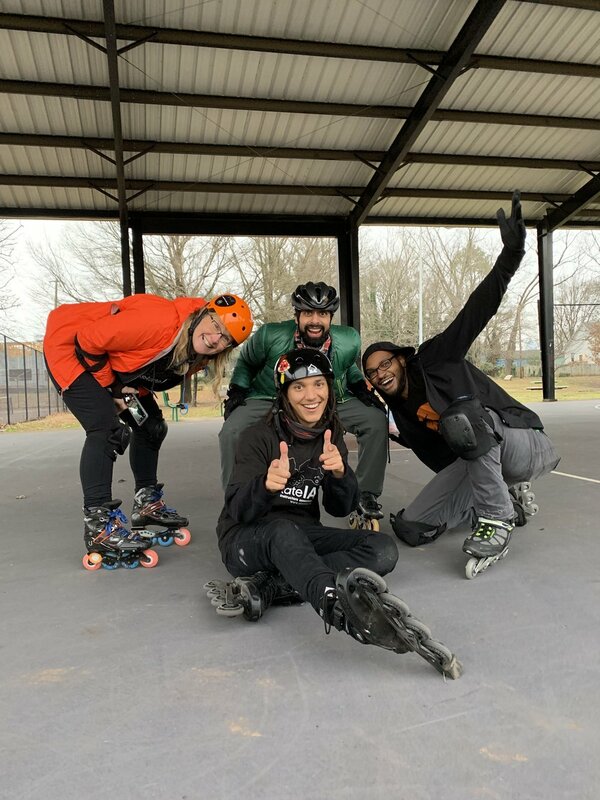 At the end of the day we are all rollerbladers whether aggressive, derby, dance, speed or art we all have wheels on our feet and love for it so lets not be "roller racist" and show love and respect to everyone and we will get that same energy right back. “They make you take the course with a brake on your skate (first time for me lol)” - Matt Lyon with his heel brake. We really respect your motivations for doing this, providing local opportunities for kids and adults interested in learning how to skate is important. Now that the spring season has started do you have any plans in motion to put this certification to work? Thank you! I feel that and it keeps me motivated. Skating seemed like a broken record so it's time to put a new one on to keep playing. But yes, starting next weekend I'm going to be helping a free skate clinic every Saturday in Powell, Ohio at their local skatepark for all ages to come check out skating and learn until the end of May. We’re also organizing more big wheel skate sessions here this year along with a marathon in October. Other than that I'll be getting myself into the local skate rink scene a little more and keep trying new ways to apply this certification. It should be easier than hurricane top souls but I'm gonna knock on wood. It sounds like you're going to have a lot on your plate this year! You recently launched the HoodpandaTV YouTube channel and you've already posted some pretty interesting content but if you had to pitch the concept to a potential subscriber what would you tell them it's all about, and how does it factor into these plans of yours? Along with skating content HoodPandaTV really allows me to tap into some new crazy ideas. Considering it doesn't limit me to 1 min like Instagram. I know how to make a skate video no prob its 90% blading and 10% lifestyle so my idea was to flip that sometimes and show people how to live a little without being so worried about real world problems. I was heavily influenced by one of my best friends, Hawke Trackler, and his videos got me into it by watching his "Living Life with HT" and "Value Life" videos. It was funny and looked fun so it attracted me to the sport and lifestyle. At the end of the day my videos are there as entertainment but for me I want my videos to bring unexpected happiness and laughter to viewers while sprinkling some blading in there. So that's what I really strive for. I do want to use that platform at some point to help teach stretching routines that may be yoga inspired and trick tips. When you look at rollerblading, regardless of the specific discipline, who are some of the people you think do the best job of making the sport accessible to beginners or outsiders that might be looking to participate? Just to name a few that I follow closely. Damon Franklin and Bfree. Those guys put out so much good energy through skating by just showing nothing but love on blades to everyone and making it look good while always inspiring the next generation . Yet at the same time you have Shredpool who is the hero we deserve! He is very talented and hilarious that kind of stuff reminds you to not take everything so serious. There’s a lot more people on the ground working towards the same goal but I couldn’t name them all. Before I let you go do you have any parting words or shout-outs you want to get in? Be kind. Be positive. Expect nothing and gain the most. Shout out Bradley lashaun (Hood Panther) Wilson, Hawke Trackler, Paul (Hood Possum) Stewart, Brandon Andersen, Jeff Kolada and Kyle Wood. These people are my foundation to helping me make content for everyone. I'd like to thank my sponsors, Oak City Inline Skate Shop and 50/50. Long and Lawrence are awesome dudes! And to y'all at Blader Union for supporting me in Skate IA and sharing my content from the bottom of my heart thank you. I'm very grateful and humbled as to where I am today with wheels on my feet I couldn't do it without any of y'all.